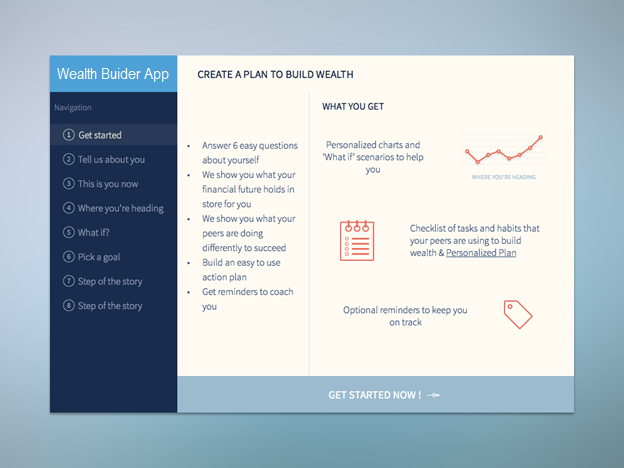 Discover simple steps and easy habits that build future wealth with the Wealth Builder App. Create a Tweet or Facebook comment to Join the pilot and get all of our tips and tools for free! Share this page on social media to preview the app. Building wealth for the future is discipline - not a secret. This powerful tool can help you make simple changes to achieve your financial goals. Learn small steps to create powerful habits based the experiences of people like you. This peer based approach helps you to achieve your goals because you can see how others in your situation have succeeded. The Wealth Project is also exploring tools to identify habits and tasks that people like you use to build wealth for the future. You will be able see how your budget, financial habits, and financial welling-being compares to other people like you (age, area, income, family size, etc.). This comparison would create a score that would allow you to focus on specific areas in which you can improve. 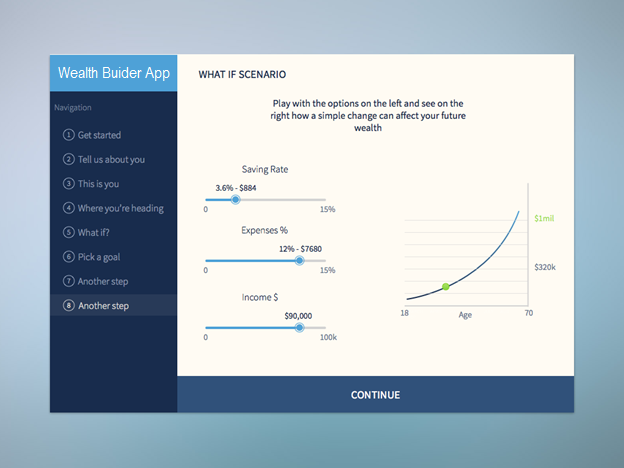 We are building interactive tools to allow you to make simple 'predictions' or 'what if' scenarios to make the best long-term financial decisions. Imagine you could forescast your financial future by entering your income, net worth, savings rate, etc. This forecast would give a range of outcomes and tell you what you can do today to improve your chances of achieving your future goals. It could identify the strengths and weakness of your financial habits and help you to focus on areas to achieve your goals. So, where to you fit in? We need volunteers to participate in our pilot program. Sign-up using the form below. You'll receive free access to all our tools as they become available. We'll ask you what you think. The good, the bad, and the ugly. "I would be interested to see what my peers are doing because it would give my own financial situation greater context. I could use it to see areas I am strong and weak relative to people in similar situations."